This research brief provides the latest annual snapshot of the U.S. home care workforce, including key demographics and a variety of wage and employment trends. This year’s research estimates there are 2.1 million U.S. home care workers who earn a median wage of $11.03 an hour and $15,100 a year. In turn, 20 percent of home care workers live in poverty, compared to 7 percent of all U.S. workers. 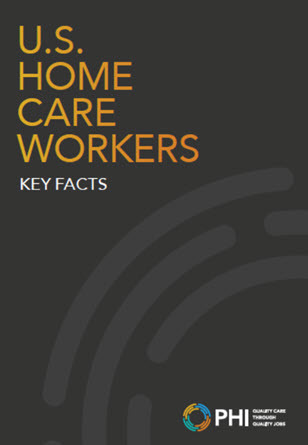 There are more than 2.1 million home care workers in the United States. The home care workforce more than doubled in size over the past 10 years, from nearly 840,000 in 2007 to over two million in 2017. On average, home care workers’ wages have barely risen over the past 10 years: inflation-adjusted median hourly wages were $10.66 in 2007 and $11.03 in 2017.